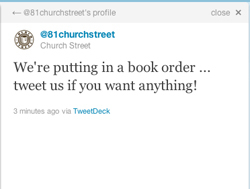 This level of interaction is going to be crucial for bookshops going forward. They don’t have to chat with me everyday. They don’t have to interrupt me every day. But they are making a very personal one-on-one service easily available to me. And I like that. Chalk this one up as a “Best Practice for Bookshops”.